We are very excited and pleased to present our first ever video to feature the wonderful work at Mother Teresa Children’s Centre. Ever wondered why we work so hard to raise income by renting JCB’s and selling bikes and books in Malawi? Well it’s all for this very special centre and these fantastic children. A huge thank you to our amazing volunteers (past and present), your efforts helped to build a dedicated and compassionate team of Care Givers. Congratulations and thank you to all the Care Givers and MTCC support staff who are working so hard to achieve the vision. Thanks as ever to Mobal Communications Ltd who funded the construction and set-up costs. This centre is helping all children in Chilomoni to have the best possible start in life and to create the next generation of Malawian Leaders. Here at Krizevac we are proud and privileged to be part of such an inspirational project. . So fetch the pop-corn, sit back and enjoy, MTCC the movie…. Like our film? Please visit our Facebook Page to like and share us with your friends. Getting ready for our exciting launch…. 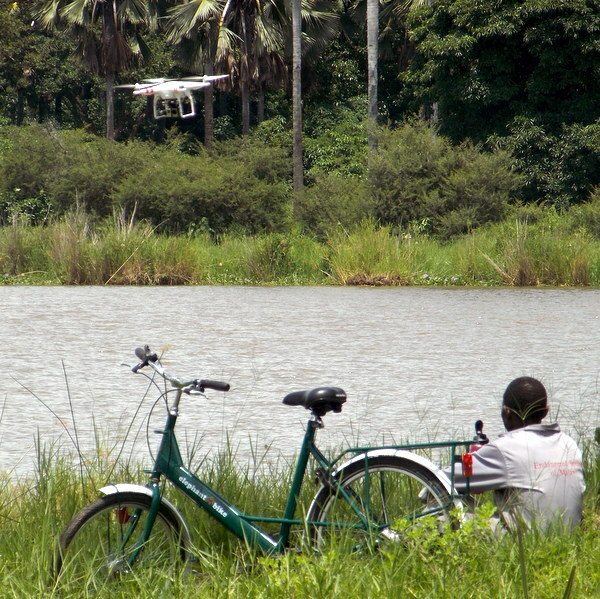 The last time we blogged about the Royal Mail bikes, it was to describe how they are helping an endangered species in Africa. This time, it’s all about how an endangered species is helping us here in the UK! As Royal Mail bikes are phased out, the mechanics who have looked after the bikes for years are being re-deployed into other roles. So a Royal Mail Bike Mechanic is now a rare species. Luckily for us, there are still a few of these precious people left and Adrian Ards, a RM Mechanic from Liverpool was kind enough to visit for a day. He came to show our team all the tips of the trade when it comes to keeping Royal Mail bikes in tip-top condition. This is going to be a huge help as we renovate a limited number of bikes ready for sale here in the UK. Adrian points out to Terry that this one really does need a saddle! Once renovated, they’ll be called “Elephant Bike”. For every bike we sell, one will be donated to Africa and in addition 100% of money made will be directly benefiting our projects in Africa as well. So buying one of our Elephant Bikes means you grab a piece of British history and help vulnerable people in Africa too. All the bikes are fully re-furbished to an incredibly high standard and painted in a range of elephant friendly colours (confused? See our blog post from 19/3/2015 for an explanation!) We’ve just got the first few back from the prison who are doing the refurbishment and we think they look absolutely beautiful! It won’t be long until we’re ready to take orders, but you can let us know by email or phone right now if you are interested! Every week for Beehive begins with assembly. It’s a time for the whole team to get together to think, reflect, pray, sing, and to share news. Each team takes a turn at leading assembly; everyone loves the sweet tones of the tailoring choir especially and it makes for an uplifting start to the week. During our recent visit, it was the turn of “Mitsidi”, that’s the place where all the volunteers live along with IT students from JPII. On hearing the news that it was our turn, we looked at each other in horror, sank in our seats and generally hoped that it may all go away if we didn’t think about it. The volunteers are never keen to offer themselves up for singing and dancing in front of 100 or so people. But this time, we had the film crew with us! “Let’s get a screen organised and show them bits of Beehive footage” I said…. pure genius, we wouldn’t even have to leave our seats. “Yes, lets make a music video” Declan said. Wait! What? That wasn’t the idea at all. But there’s no stopping Declan when he has a good idea! So here it is, the Mitsidi gang, lip-syncing to Chove Chove, with some snippets of Chilomoni and Beehive as filmed by the amazing Brian and Ollie. I am sure they won’t thank me for publishing this, so I should point out that it was a quick 15 minute edit, not one of the “real” films, they’ll be coming very soon. We’ve just made the 5000 mile trip back from Malawi, another incredible trip to the “Warm Heart”. This time Krizevac was lucky to be joined by Ollie Bostock of Hewitt and Walker and Brian Hardy from Sue Overton Advance Practice. They volunteered their considerable skills as film makers for two weeks to produce some updated films for the Krizevac website. 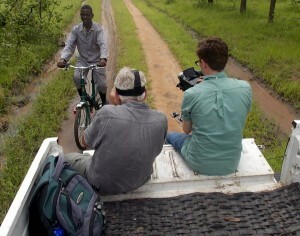 Pictured here, Ollie and Brian are being adventurers and adventurous in Liwonde National Park. Six of our Royal Mail Bikes were donated to the Leefa Team at Liwonde. Their role is to maintain the Rhino Sanctuary fence, so the rare black rhinos can thrive in a natural but protected environment. The fence is damaged on a regular basis by elephants who don’t care much for personal space! We were lucky enough to meet Bentley Palmer, principal donor of the Rhino project, an incredible man who is passionate about protecting this endangered species. He was kind enough to spare a few moments to be interviewed and he explained why “Royal Mail Red” really isn’t suitable for bikes in the bush. The bikes need to blend in, so they don’t attract too much attention from the elephants. Wallace one of the Fence Maintenance Team told us a hair-raising story of how he was once chased for twenty minutes, pedaling furiously to get away from an angry elephant! Ollie and Brian captured some great footage of Wallace patrolling the fence on his very safe, very green so as not to be seen, “Elephant Bike”. Is it a bird? Is it a plane? 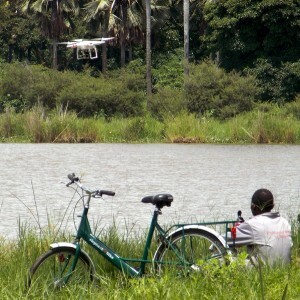 No it’s the drone camera capturing footage of Wallace relaxing by the Croc filled river! Special thanks to Krisztián Gyöngyi, Rhino Monitoring & Research Ecologist, who gave us so much time and help so we could film the donated bikes in action and to Orsi for the kind hospitality. Watch this space… new films coming soon!